According to the Rashtrapati Bhavan, Pranab Mukherjee (former President), Late Nanaji Deshmukh (social activist) and Late Bhupen Hazarika (Assamese singer) will be conferred the country's highest civilian award Bharat Ratna. This means hockey champion Major Dhyan Singh Chand has once more missed out on the prestigious award. Chand was captain of the Indian hockey team that went on to win the Olympic gold medal in 1936 (Berlin Olympics) and was a pivotal part of the previous two gold medal-winning teams in 1928 (Amsterdam) and 1932 (Los Angeles). Over a 22-year-long career, Dhyan Chand scored over 1,000 goals, of which 400 goals came at the international level. His goal-scoring ability was remarkable. The 5-foot-7 Chand was a master at dribbling and exercised tremendous control over the ball. His dribbling skills were so incredible that he was often fondly called The Magician or The Wizard of hockey. Such is his legend that officials in Netherlands reportedly broke open his hockey stick to check for a magnet inside. The little maestro started playing hockey during his army stint. He used to practice in the late night after his duty hours. With his exceptional skills on display, he soon became part of Indian Army team which toured New Zealand in 1926 and won 18 of their 21 matches. Chand's performances were hugely appreciated and he was promoted to Lance Naik upon his return to India. In 1928, field hockey was reintroduced to the Olympics and Chand was part of the team. He began the tournament with a hat-trick and his form continued through the competition. He would score a total of 14 goals. By the 1932 Olympics, Chand was an automatic choice in the team. He scored eight goals in the tournament as India lifted their second consecutive gold. After the Olympics, the Indian team toured internationally, including to the United States and England. In 37 matches on the tour, India won 34 with Chand scoring an astounding 133 goals. Following this he was rightfully considered the best player in the world. In 1936, Chand was the captain of the team that flew to Berlin to complete a hat-trick of Olympic gold medals. His team would go on to beat Germany 8-1 in front of Adolf Hitler. Chand continued playing hockey for India till the late 1940s. He retired from Army in 1956 as a Major and went on to become a coach. How have events unfolded since then? In 1956, Chand was conferred the Padma Bhushan for his contribution to sport. His day of birth, 29 August, is marked as the National Sports Day in India. When sportspersons became eligible for the Bharat Ratna in 2011, there were immediate calls for the legend to be given the country’s highest civilian honour. The cries only got louder after Sachin Tendulkar was chosen in 2014 to become the first sportsperson to be awarded the Bharat Ratna. 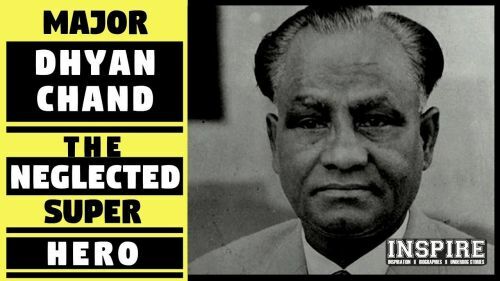 Dhyan Chand undoubtedly is among the greatest players to have graced the game of hockey. He was a leader on and off the pitch and was a true example of the spirit of sport. The Bharat Ratna will be a befitting tribute to this great national hero, who stands as high as anyone else in India.